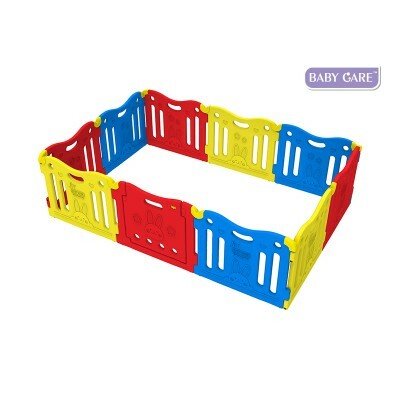 The BABY CARE Playpen is 2,19m x 1,47m large, 63,0cm high and fits to a large BABY CARE Playmat. The door is secured by a dual lock that needs to be pressed in order to open. The panels are protected on top by panel holders to provide more stability. The structure is flexible and can be arranged in different shapes.